The Washington Capitals have never been in this position before: one game away from winning the Stanley Cup. Because they have a history of fizzling out in the playoffs, the Caps were written off as a team that would not make it this deep into the postseason. They should have lost to the Columbus Blue Jackets in the first round after losing the first two games. Their second round was a toss-up, an evenly matched six-game series with the reigning Stanley Cup champions, the Pittsburgh Penguins. They had to skate into overtime in Game 6 to win. Then the Caps fell behind the Tampa Bay Lightning who won three straight to lead the series 3-2. Washington came back to win the last two games and the Eastern Conference Finals. All the while people were expecting goalie Braden Hotlby to be pulled at any moment. He’s given up over 50 goals in 23 games, posting two shutouts against Tampa Bay. Just when the Caps looked like they would do what they usually did in the playoffs, some players would step up and give them a clutch goal, a timely check or an eye-opening pass. After Game 4 winger Devante Smith-Pelly said he couldn’t explain why he only scored seven goals all season, but five in the playoffs, including goals in Games 3 and 4 of this Stanley Cup Final. He also said he liked the way he was playing: a more aggressive forecheck in particular. He also liked the way his team was playing all around. Then of course there is Evgeny Kuznetsov, the scoring machine who suffered an injury in Game 2, but was back for the next game and scored a goal and an assist. In Game 4 Kuze had four assists. He has seven points in this Stanley Cup Final, 31 in the playoffs. Kuznetsov is the playmaker who can lead this team to the trophy. 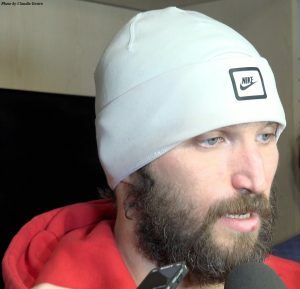 On the other hand, there is Washington’s spiritual leader: Alex Ovechkin — Ovi. He has four points in the Final: two goals and two assists. Ovi is the spiritual leader in the sense that he is the fire in the heart of this team. Fans watching every game of this series saw when Ovechkin scored the goal in Game 2 something in the team’s attitude changed and they began to look like they were going to win this championship. 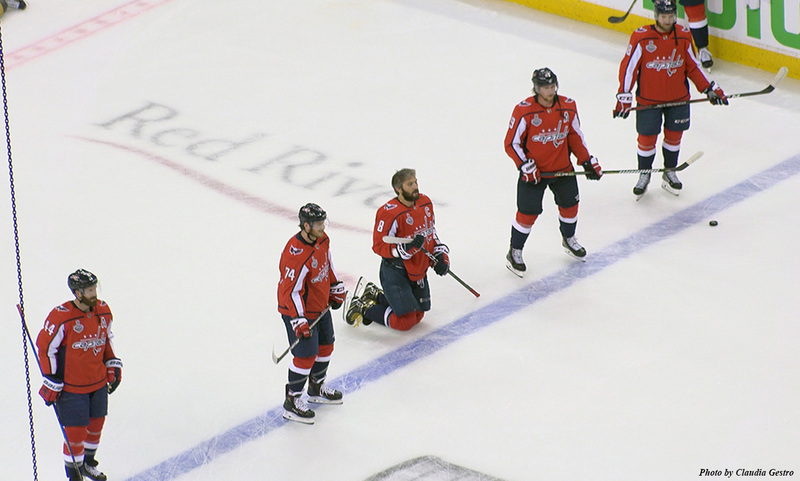 The Caps scored two power play goals in Game 2, the first by Ovechkin. It’s no surprise to Caps fans their team has won the last three games. Ovi has been in the NHL for 12 seasons, all with the Capitals. Whatever he has that fires up his team, Ovechkin will pour it on in Game 5. It also helps when your team gets the good bounces off the net pipes and the opposing team doesn’t. That would be the Vegas Golden Knights. At the beginning of the season the odds of the Knights getting to and winning the Stanley Cup Final were 500-1. There is no doubt many Las Vegas residents made that bet. Once the season began the Golden Knights started turning heads. They led the Pacific Division — in their first NHL season. With a cast-off goalie. They swept the Los Angeles Kings in the first series of the playoffs, and then won a tough six-game series against the San Jose Sharks. There were two overtime games in that series and Vegas lost Game 2 but won Game 3. San Jose was supposed to be the team in the Western Conference Final, not this expansion team with a bunch of players the rest of the league was willing to cut loose. These things just don’t happen in major professional sports leagues. Until this year when Vegas advanced to the Western Conference Final to face what many believed to be a superior team: the Winnipeg Jets. The big surprise of this Cinderella inaugural season was their take down of the Jets in five games. Winnipeg finished ahead of the Knights in the standings so Vegas had to start the series on the road. They lost the first game in Winnipeg and armchair prognosticators across North America were predicting a Canadian team playing in the Stanley Cup Final. Until Game 2 of the Western Conference Finals. 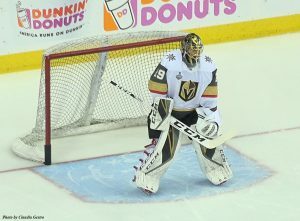 The Vegas defense got back in gear and held the Jets to just six goals in the final four games, which the Golden Knights won. And then they did. Vegas made off with the win in what turned out to be a very exciting Game 1. Could this expansion team actually win the Stanley Cup? After the game the Caps all said Vegas is a great hockey team. They wouldn’t be in the Stanley Cup Final otherwise. Since that first game of this historic Final, the Washington Capitals have played like a team possessed. When Alex Ovechkin scored his first Stanley Cup Final goal, after 12 long years striving to get into this series, the entire team began skating with a higher purpose. Not that the Vegas Golden Knights made it any easier for them. The Caps just changed. 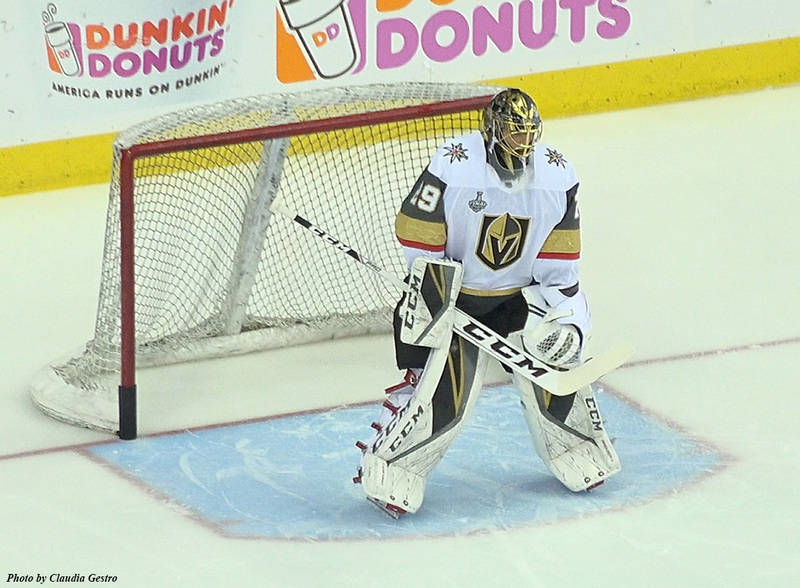 In Game 4 Marc-Andre Fleury was beginning to show the effect of playing the Capitals. The defense and offensive in front of him wasn’t giving him much of a break. They made mistakes on defense, had problems scoring goals; they saw their share of pipe clunkers show up in one game. The Knights were frustrated and played that way. They didn’t get their first goal until the third period, after giving up four goals to the Capitals — who scored two third period insurance goals just to be sure of a win. Now we are back in Las Vegas for Game 5 of this unlikely Stanley Cup Final. The last time the Capitals were Eastern Conference Champions President Bill Clinton was getting impeached. Neither team has ever been at this juncture in the season before. The Vegas Golden Knights barely existed a year ago. Never played a season before October of last year, never been in a NHL playoff game as a team before. Never been in a Stanley Cup Final. 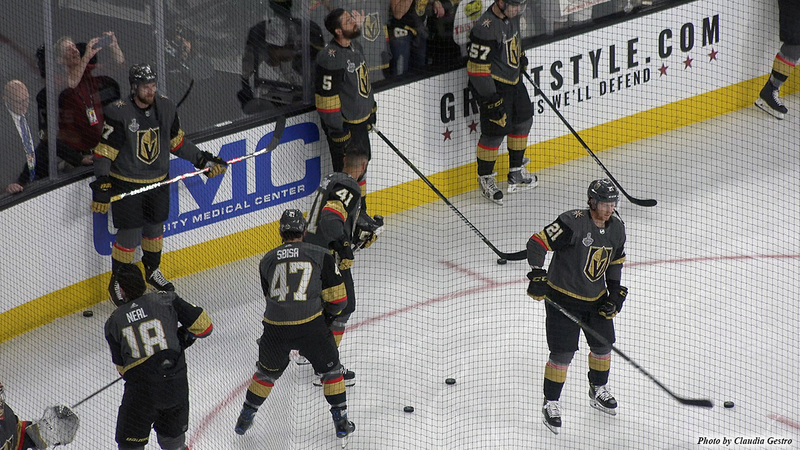 The Knights need William Karlsson, Jonathan Marchessault, David Perron and Brayden McNabb to step up and lead their team to a win. They belong in this series and tonight they need to prove it. For Washington, in 1998 the Detroit Redwings swept the Capitals for their second Stanley Cup in a row. This is all new territory for each franchise. The Knights have their backs against the wall and they have to win to continue. The Washington Capitals are one game — this game — away from hoisting the most celebrated trophy in sports above their heads. Neither team is a fluke, both teams earned their places on that ice. 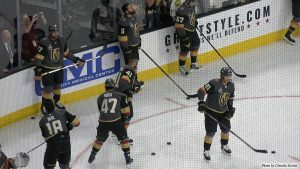 Only two members of the Vegas team have Stanley Cup experience, James Neal who played with the Nashville Predators when they lost to the Pittsburgh Penguins — the team Marc-Andre Fleury was on at the time. Fleury has three Stanley Cup rings. Brooks Orpik, defenseman for the Caps, was a teammate of Fleury when they beat the Detroit Redwings in 2009. That’s it for the Stanley Cup Final experience in tonight’s game. The oddsmakers are picking Vegas to win this game. Washington is a +125 underdog. Oddsmakers have been wrong before of course, but they are right with the vast majority of their picks. Then there is this fact: no team has blown more 3-1 playoffs leads than the Washington Capitals. They did it five times. Can they break the pattern in Vegas tonight? Right now this is their series to win — or lose. At 8 p.m. Eastern Time, 5 Pacific, we will see the game to answer the questions. If you made that 500-1 bet in September, hold on to your ticket. Below are the video reports from Claudia Gestro. You can watch her reports in Spanish HERE. We would like to thanks A1A Activewear for their support of our sports reports on YouTube. Top photo is Capital One Arena in Washington, D.C.